Polished beveled edge with a brushed finish, 6 pieces White Cubic Zirconia to compliment this fantastic unique style. Width: 8mm. Imagine wearing a ring that never needs polishing, a ring that is virtually scratch proof. rings are prefect as a wedding band or as a fashion accessory. Tungsten carbide is 4 times harder than Titanium. Rated between 8 and 9 on the Mohs scale the hardest of which is diamond being rated a 10. 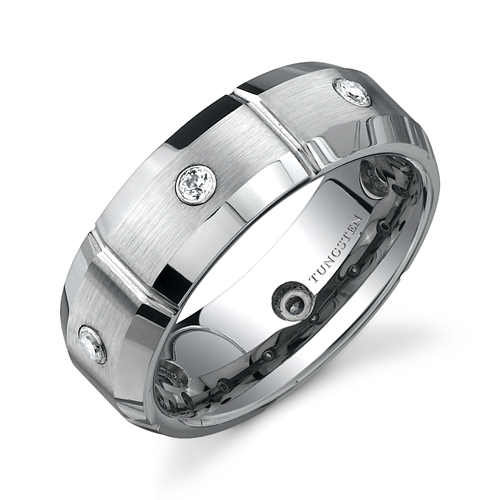 Completely hypoallergenic our Tungsten carbide rings will never turn your finger green or cause irritation to your skin. If you need a durable yet elegant ring this is for you. Q: can the white cubic zirconia be replaced with other gems,ie. ruby. and if so, how hard is it??? A: You can order the ring and take it to a local jewelry store to have them set the stones for you. We do not work with precious stones here, but many customers order these rings and have it done locally. This is a very simple process. I hope this helps you in making a decision on your purchase. It may not be what you wanted to hear, but it is our best advice. Was this answer helpful? 48 of 49 Customer(s) found this Answer helpful. Q: Are the stones covered under warranty? A: The stones are covered for the first 30 days. Was this answer helpful? 27 of 32 Customer(s) found this Answer helpful. Q: how much for shipping and handleing? A: All orders come with Free Shipping. You can speed up the process for overnight or 2nd day for an extra fee. Free shipping is about 2-5 days. Hope this helps! A: I am sorry, this only comes in the color above for now! If/when we do get a new color or this in gold, we will let you know! Q: Is this ring made out of Tungsten or Tungsten Carbide? Q: Does this ring come in a width of 10mm or more? How are the stones set, are they in white gold? I will have to get the stones switched. Can you ship to Ontario, Canada? Thank you. A: Hi Kevin, This style comes in the 8mm shown only. The stones are set with prongs and reinforced with tungsten. We ship to Canada everyday. There are no duties, taxes or landing fees and shipping to Canada is 4-9 days to arrive. Hope this helps! Q: Can the Armon Tungsten Ring 8mm be engraved? A: It can be engraved, but there is such small space on the inside of this ring (due to the holes for the stones) that we recommend only 2-6 words or just initials. Was this answer helpful? 12 of 20 Customer(s) found this Answer helpful. Q: what size stones are needed if you want to replace the cubic zirconia? Q: Is this ring sterling silver or white gold? Currently, this ring is only available in the color above. This ring will be available in Gold this spring. Q: does this ring come in womans or 5mm? Q: Can I get this in matching set 8mm and 5mm ? Thank you for the question. We can get this for you in a 5mm band, but it would take two weeks to ship to you. If this is okay, please order both rings and in the comments section at checkout, tell them that you want one of the sizes in a 5mm band. We will confirm with you and get this taken care of right away. There is no price difference and that is it. Q: Are the sets cut glass or some other material? A: The stones are made of white cubic zirconia. Hope this helps! Thank you, TF! I sent back the ring the first time because it was to big. You changed it out no questions asked. Thank you. This ring is sturdy and looks well because it's not shiny at all. It has a duller finish. The stones also look a lot like diamond and that's even better. I recommend and refer all my friends to this site. Great prices and good jewelry! I received my ring ID style 42 in order Z 20581. I am very satisfied with the quality, the look, the price and the service. the only thing I am not satisfied with is the size. I am a size 11.5 for every ring I have bought and tried and the sizing standard in every jewelry. Your ring fit is to big. I will have to buy another ring size 11 so it fits correctly. Excellent quality. A beautiful replacement ring for my husband. I have two Armon Tungsten Rings 8mm, when I saw my first ring I wanted another one (two of the same kind). These Armon Tungsten Rings never need polishing, looks beautiful on my fingers.They have a comfortable fit(smooth), just a joy to wear. I look forward to buying more Tungsten Rings. I was very much impressed with the ring and the quality. This company rocks, First time I ordered, ring was too small, returned and wow they sent me the next size up and have been wearing it since, fits perfect, looks great and one heavy item. Would order again. At this price - this ring is the same exact ring I saw at the mall for $300! What a steal! We purchased 4 others ahahah, lots of savings for Christmas and lots of happy faces! I love thpf design of this ring. I am impressed with how nice this ring looks! I get at least 3 compliments on a daily basis! The only negative thing is that I've gained 10 pounds and now it's too tight! We bought this actually in December for our wedding but 2 of the stones came out within 2 months which is our reason for ordering another one! We love the look & style just hoping the stones stay in this one! Already have referred you to several people! Thank you, the ring is nice and so far it has worked out. It is a good quality ring. I will be ordering from you again in the future. I bought the ring for my hubby and it looks so elegant and not expensive. He loves the ring and the customer service is great! Hi we love the ring but my husband needs a 10.5 instead of the size 10. We weren't sure at first but seems like the 10 is a bit too small. I've been singing your praises! I am so happy that I went with your company when I decided to purchase a wedding band. This ring is beautiful and I get lots of compliments on it. I will definitely be referring folks to you and I will definitely be purchasing again. In addition I found the purchasing process to be smooth, shipping fast and the customer service great! Also, kudos to you for your commitment to marriage equality! Received the ring, it fit great, and he loved it. I was a little disappointed in the engraving, it was soooooo small your have to get a magnifying glass to read it. But all is good. Again thank you very much. My wife is changing hers to match. We will certainly refer others to your website! We placed on order for a men's wedding ring and upon its arrival we were delighted to see that it was everything that we had hoped it would be! Thank you for the professionalism....we will certainly refer others to your website! The quality and style of the ring is excellent.